City Palace is the most famous out of the other palaces. This is the place to take a stroll into the glorious periods of Rajas and Royal families. Jaipur shows a mix of all the traditional Indian things – vivid colours, crowdy markets, lavished delights and most importantly, a traditional walk into history. There are many beautiful monuments and forts which are among the best in the country in the city which shows the glory of Rajput era. The City Palace was built by Sawai Jai Singh II who gave the initial structure to it from the year 1729 to 1732. After that, to make it among the most awe inspiring fort in the city, two able architects Vidyadar Bhattacharya and also the Sawai himself used the fusion of Indian ttadition with Mughal and European details. The two palaces – Chandra Mahal and Mubarak Mahal were included in it and it was the ruling place of the king. Today also, the City Palace represents the glory and respect of the Rajputs. There is also a museum in the City Palace. The other notable parts of the City Palace are the Diwan – I – Khas, Pritam Niwas Chowk, Diwan-I-Aam, Maharani’s Palace, Baggi Khana and the Govind Ji Temple. There is also a story associated with it. Ishwari Singh, son of Jai Singh who died after being bitten by a snake and his 21 wives committed ‘sati’ by sitting in the funeral pyre of their husband is still can be listened by various people in the half ways and corridors of the palace. If you visit the palace, then you must listen to the stories associated with it. Access to the Chandra Mahal is through the inner courtyard. Here, there is a Ridhi Sidhi Pol which has small four gates which are decorated with the themes of four seasons and many Hindu gods. 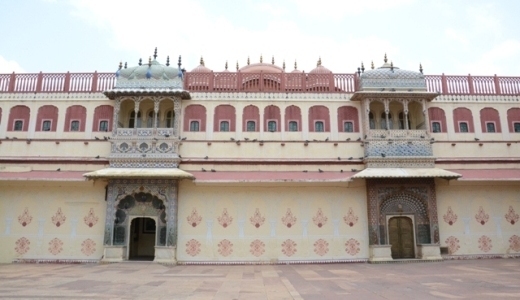 The royal family of Jaipur lives in the Chandra Mahal Palace, inside the City Palace complex. However, the ground floor of this palace is open to the public. The Pritam Chowk is an enchanting enclosed courtyard with four 18th-century gateways, elaborately decorated in brilliant colors. This courtyard was originally used for royal dance performances. Pritam Niwas Chowk is dominated by Chandra Mahal, the most picturesque courtyard in City Palace. Pritam Niwas Chowk name means “Courtyard of the Beloved”. The four gates are beautifully carved, painted doorways and decorated with themes representing the four seasons. The gates are Peacock gate, Lotus gate, Green gate and Rose gate. Lotus Gate is with continual flower and petal pattern suggestive of summer season; the Green Gate, is also known as the Leheriya gate which means waves, in green color suggestive of spring, and lastly, the Rose Gate with repeated flower pattern which shows winter season and dedicated to Goddess Devi. It is also surrounded by beautifully painted walls and overlooked by elegant wooden balconies. The balcony above the gates was used by performing singers.